While the summer holidays were looming, we were looking for something cultural and fun to do with our two under 10s, and what better than an outdoor theatre production? 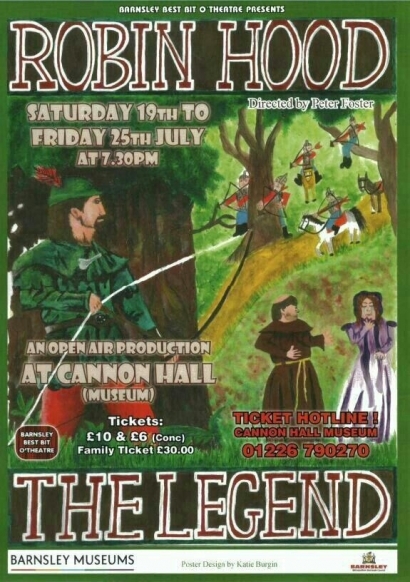 The tickets were reasonably priced (£30 for a family of two adults and up to three children), and the weather looked as though it was going to be perfect for a late evening picnic while we watched some of Barnsley’s finest actors and actresses perform the Legend of Robin Hood. So, on Thursday 19th July, our small family headed out to the beautiful park lands surrounding Cannon Hall. After a small amount of confusion and walking around somewhat lost to get our pre-booked tickets, we happily settled down to the side of The Pavilion and awaited the beginning of the play. I had heard some ominous mentions of ‘the play starting down there’, but when I saw the rest of the audience happily sprawled on their picnic blankets with their food spread out in front of them, I relaxed some. And so, the play began with a lovely introduction from Director Peter Foster. Those who have attended the Lamproom Theatre’s recent pantomime productions will recognise the name as one of the small theatre’s most loved cast and crew members. He’s also appeared several times in Coronation Street and Emmerdale, to name a few. But, I digress. Tonight, he was playing (as well as directing/herding) The Spirit of the Forrest; a narrative role in which to tell the tale of Robin of Loxley. For the first ten or so minutes of the play, we were treated to Peter’s trademark audience participation. While he humiliated – ahem – had fun with a number of the adults from the audience, we were lulled into a relaxing and laughter fuelled time. Until that is, Foster requested us all to get up and follow him. Bringing all of our picnic blankets, chairs, bags and other paraphernalia with us. What followed was an exhausting – but fantastic – hour and a half of gallivanting around the rather beautiful Cannon Hall Park. Not that we actually got a chance to appreciate all of its breath-taking beauty for more than a few moments. Think around a 100 people, made up of all ages from toddlers to grandparents and abilities, traipsing after a tall bald man in a long tunic and boots and recorder playing wood nymph, and you’re probably half way there. From The Pavilion, we walked uphill to the old stable area where we first met the evil Sheriff of Nottingham, resplendent on a beautiful horse, as he evicted Much the Miller and family for not being able to keep up with their extortionate rents and taxes that he had introduced. As the story of Robin Hood is so well known, there’s no need to retell it in detail here. Except that once we’d raced after the Spirit of the Forest and settled down at each new setting, we were transported from the relative peace and tranquillity of the South Yorkshire Park, into the landscape of fear and poverty of Plantagenet Nottinghamshire. The actors played their parts beautifully. Again, with another couple of familiar faces from the Lamproom’s recent Pantomimes in the shapes of Friar Tuck (Dean Love), and Maid Marion (Amie Stone). The cast interacted beautifully with the audience – from giving us an impromptu shower when Robin and John Little are dunked into the river at their first meeting, to the magnificent Sheriff milking the boos and hisses with relish. Foster gave his rather devilish grin when each one of his ‘people of Nottingham,’ were greeted with somewhat breathless and tired groans. By the time the play came to its finale, with Cannon Hall itself as the magnificent backdrop for Robin’s and Marion’s nuptials, the audience was cheering loudly enough to drown out the actors lines. Where we got the energy from, I’ll never know. Final thoughts on the play? For £30, we not only got to see some of Barnsley’s finest actors and dancers perform brilliantly, but we also got a rather energetic and unexpected work out. We were literally left breathless with the beauty of the backdrop, the standard of acting and the hilly walk around one of Yorkshires hidden gems. « REVIEW: ANTESAINT – HOLD ON E.P.